John Guare has 1 media appearance. Join us for a reading group discussion of Six degrees of separation by John Guare! In this soaring and deeply provocative tragicomedy of race, class, and manners, John Guare has created the most important American play in years. Six degrees of separation will be performed by Stray Dog Theatre June 6-22; discuss the play at Left Bank Books and then go see the show! 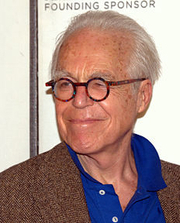 John Guare is currently considered a "single author." If one or more works are by a distinct, homonymous authors, go ahead and split the author. John Guare is composed of 4 names. You can examine and separate out names.